Boston College Football, featuring the Boston College Eagles is one of the biggest venues in the school's life. Within the ACC, the Boston College Eagles are one of six teams in the Atlantic Division, a Division I Bowl Subdivision (formerly known as Division I-A) league governed by the NCAA. Check out Hotels near Boston College, if you want to stay close to the games. Check out on our Boston College Eagles Football Schedule, who the Boston College Eagles are playing when and where. It was way back in 1892 when Boston College was one of six "Major College" football programs in New England, designated by NCAA classifications, starting in 1938. By 1981, and for the remainder of the 20th century, BC Football was New England's sole Division I-A program. In 2007, the Eagles captured the ACC's Atlantic Division Championship and finished the season ranked in the Top 10 for the first time since 1984. Besides Notre Dame, Boston College is one of only two Catholic universities that field a team in the College Football Bowl Subdivision. The Boston College Fight Song is also the oldest of all the college fight songs in America. 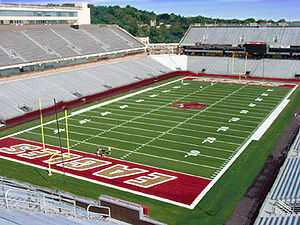 The The Eagles' home games are played at Alumni Stadium on the Boston College campus in Chestnut Hill, Massachusetts. The stadium, opened in 1957, is situated approximately six miles west of downtown Boston (within the city limits of Boston), although its postal address is Chestnut Hill. The current seating capacity of the stadium is 44,500. Get your Boston College Football Ticket and come out to be one of these fans. Just before the 2010/2011 season BC will become the 4th Football Bowl Subdivision team to switch its athletic outfitter to Under Armour. Their previous outfitter was Reebok. We are certain you will love the new Boston College Apparel.